Sampans skim past, laden with heavy cargo that sinks their hulls into the murky brown water. Women cast circular fishing nets, then slap the water with paddles to attract fish into the traps. Children lie on wooden decks scribbling homework as a stove seeps tendrils of smoke under a weathered pot of pho. The faded wedding photo nailed to the wall displays a smiling younger image of the woman now selling the jewel-colored silk robes and jewelry that she herself will never own. 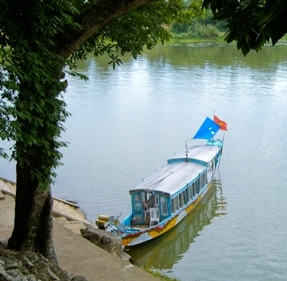 Drifting down the Perfume River by Dragon Boat is one of the best ways to explore the historic sites, royal tombs and temples of Hue—renowned as the spiritual, artistic and culinary heart of Vietnam. It’s the perfect opportunity to intimately experience the culture of the good-natured, gentle people who live year-round on Dragon Boats. There are few guards, fewer crowds, and no restricted areas … but the countryside is quickly modernizing and such a trip may soon dissolve into the mists of time. River breezes offset the thick, humid heat as the boat, smelling faintly of diesel and spices, seems to glide into the past, unhurried. Painted to look like a floating dragon with bright yellow scales, bared teeth, a shaggy white beard and horns, the boat becomes a character on the journey. It pulls you away from Hue … deeper into the heart of its people over the many stops along the day-long excursion. At the curve of the river, the seven-tiered Thien Mu Pagoda looms high on a bluff. There are no handrails on the steep, slowly crumbling stone stairs leading up to the Buddhist monastery complex. Young children with shaved heads, wearing robes, chatter through lunch then retreat to quiet corners to study. At the end of their travels they will join fellow monks whose stone graves lie scorching in the sun just beyond the low stone fence that borders the forest smelling of cool, wet pine. Hon Chen temple, built on a stone promontory, is accessible only by boat. 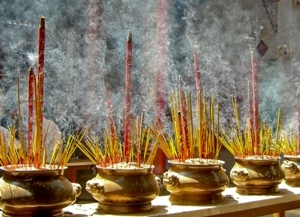 Spicy sweet joss sticks burn quietly in a pan of sand. A family reverently lays offerings of dragon fruit, mango and yellow chrysanthemums at the shrine. Immersed in ritual and prayer, they take no notice of visitors. Downriver, you can wander the ruins of the Citadel and run your finger over the smooth, brightly colored pottery shards cemented into the façade of the Royal Library. Step back a few yards through the uneven grassy field and take in the scale of this fortress, once home to 13 Nguyen emperors and two modern-day armies. There are no restricted areas … no barriers between you and history. The best time to visit Hue is during Tet (Lunar New Year), when the towns and villages overflow with golden chrysanthemums, feasts and fireworks. Buy a ticket at any Hue travel agent or local hotel. 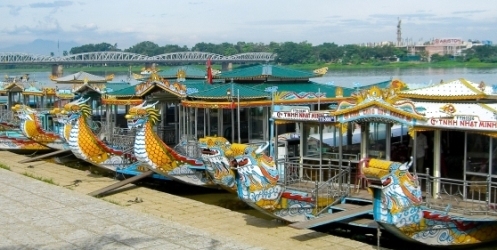 Full-day tours can be chartered for US$ 12 per hour at the tourist boat pier, next to the HCMC Museum. The booking booth is open daily from 6:00 am to 10:00 pm (phone 828 945). Entrance fees to sites are not included and you will need to pay extra for a taxi to take you to any site that is not close to the river. Bring an extra bottle of water, especially during the dry season (March to August).